Heart; passion; love: this trifecta is something that we have to struggle to achieve in video games of late. The mass marketisation of the medium has led to some unfortunate financially motivated decisions, most prominently the release of identikit game after identikit game, with the singular difference between one game and the next being the numeral given to its iteration, with these decisions adding up to draining the passion, heart and love out of the vast majority of games being published. A notable and laudable exception to this tendency that seems to be becoming a rule is the output of Platinum Games: MadWorld, Bayonetta and Vanquish are games that lack a certain widespread appeal that would translate into high volumes of sales, but do what they do incredibly well and with a view to entertaining those for whom the concepts appeal, no more than this; nor any less. 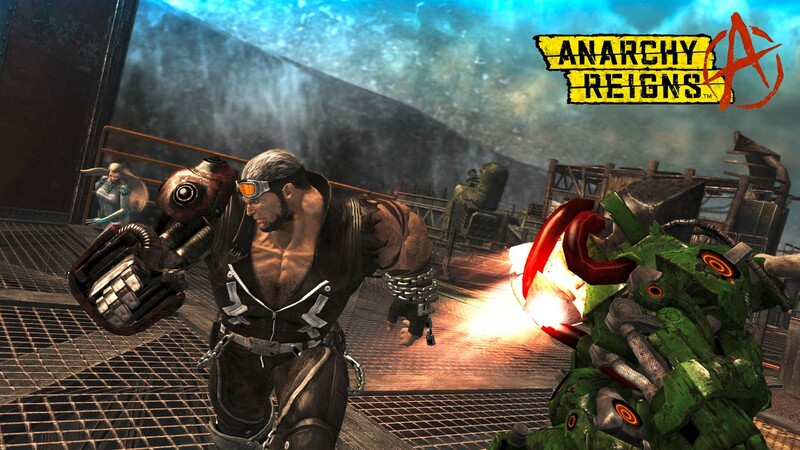 Anarchy Reigns is another game very much from this stable of high-octane action designed with a flair difficult to find in contemporary Western game development. The game offers a highly-stylised world that keeps on giving. Legally mandated though it may be, the game’s warning about photosensitive epilepsy in one of its first loading screens turns out to be quite prescient: once one enters the action, the game is quite keen to make those unfortunate enough to suffer from this condition be reminded of this fact. The game’s visuals are a stark departure from the now-traditional dark browns, greens and yellows that plague many new releases. Bright reds, oranges and greens accompany all action, as well as adorning the vestments of the many enemies that the player will have to face. A particularly wonderful trick employed by the game also ensures that the scenery never stays the same long enough for the player to grow weary of it: the carpet bombing of regions, runaway vehicles and the release of poisonous gas serve to change the environment from time to time, creating visual distractions, as well as changing the decision matrices of all players within a stage. Anarchy Reigns is about keeping players on their toes, scared to move for fear of whatever disaster is about to engulf the map while remaining eager to see what novel situations the game has to throw at them. It is not just the scenery that is so compelling in terms of the visuals of Anarchy Reigns: the animations of the player characters in walking, dashing and combat motions is fluid. The larger characters “feel” larger with their slower movements and wider-ranging attacks, with the more spritely amongst them being wonderfully nippy and acrobatic in how their combat works. Variety abounds equally in enemy types, between the less grotesque and more-human-looking Killseekers and the larger, more hardy Executioners and Bezerkers, as well as in the weapons on offer across the player characters and enemies, each with a unique appearance and set of effects. 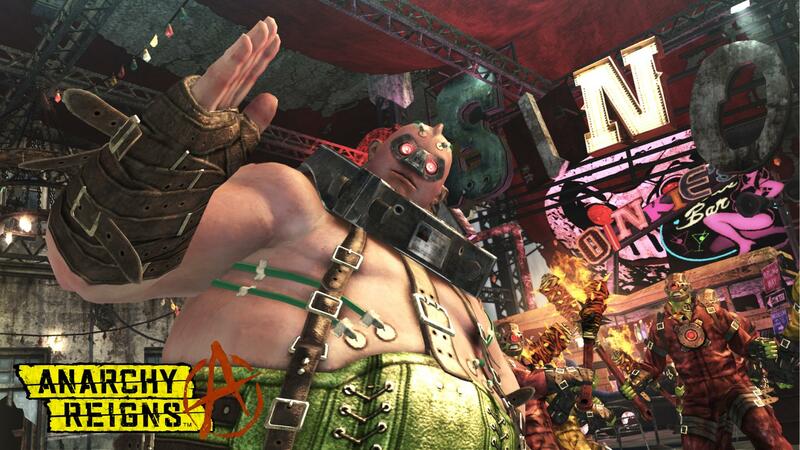 Anarchy Reigns is wonderfully realised. The gameplay itself harkens back to the cult-classic that was God Hand, if a little more forgiving. The core of the attacks that a player can dole out are split between a light attack, bound to Square, and a heavy attack, bound to Triangle, with Circle acting as a throwing button, both for items in the world and for grappling moves. From this fairly small selection of basic moves, a great amount of depth is added to play by virtue of the the shoulder buttons being used as modifiers. L1 or L2 combined with either of the attack buttons will lead to an attack using the player’s “Killer Weapon”, a weapon unique to each character. Uses of this weapon are limited by a power bar of four blocks: a light attack uses one bar, a heavy attack uses two, with the bar being regenerated by the use of normal attacks or by the player taking damage. Chaining normal light and heavy attacks with Killer Weapon attacks is particular enough in timing to be challenging and perform enough damage to feel satisfying. Killing a larger enemy with only one combo is spectacular to watch and feels nothing but wonderful. Though a game premised conceptually on something like being a three-dimensional Streets of Rage with added mutation may seem fated to be somewhat shallow in its available game modes, Anarchy Reigns does a wonderful job of providing the player with sufficient variety to make the game a keeper in both single and multiplayer. Superficially, the singleplayer campaign consists of two intertwining storylines, the “Black” and “White” sides, each focussing on one of the two core single-player characters, giving the player to play through the singleplayer campaign at least twice. Beyond this, however, the game provides a series of game modes premised around the core brawling mechanic of the game, and different ways in which to engage with them. From moving large spheres into goals to piloting a helicopter-like weapon, there is so much more on offer within Anarchy Reigns than one might immediately expect from its genre. The campaign itself takes the form of a series of story missions and “free” missions, intended to allow the player a framework for earning points in order to unlock further missions. Though the campaign itself is short, at around six hours per playthrough, it is of a length such that beating through the hordes of enemies that are thrown at the player by the game never becomes a chore. Combine this with the bitesize chunks that the campaign is divided into and the game becomes a wonderfully concise and engaging exercise in gameplay. Pure, unadulterated, pretence-free gameplay, replete with the sorts of boss battles that are typical of games of a bygone age of gaming. Thumbs will be blistered and joypads damaged over the brutally punishing play in these boss battles, but in spite of all of this, the message will be of how wonderfully satisfying success is. The mutliplayer is equally engaging, with success in the singleplayer game translating to more characters being available to play in the multiplayer. Fighting against fifteen other players in a large all-out brawl is something that has to be experienced to be believed. If a complaint has to be levied, it would be that it can be difficult to get a game at the moment. This, however, is more likely just a symptom of being a little near to the release date in the US and EU, and the lack of copies available on shelves, in the UK at least. Charm is the defining characteristic of the game, in the long run: the level of characterisation on offer in the game even merely in the character models and their fighting styles is unmatched by so many games within the brawler genre. Add to this some good (and some wonderfully terrible) voice acting and some wonderfully witty writing and Anarchy Reigns becomes a hit not only on the basis of its addictively deep gameplay and wonderful visuals, but also through its cast of eccentric, unabashedly shameless characters. 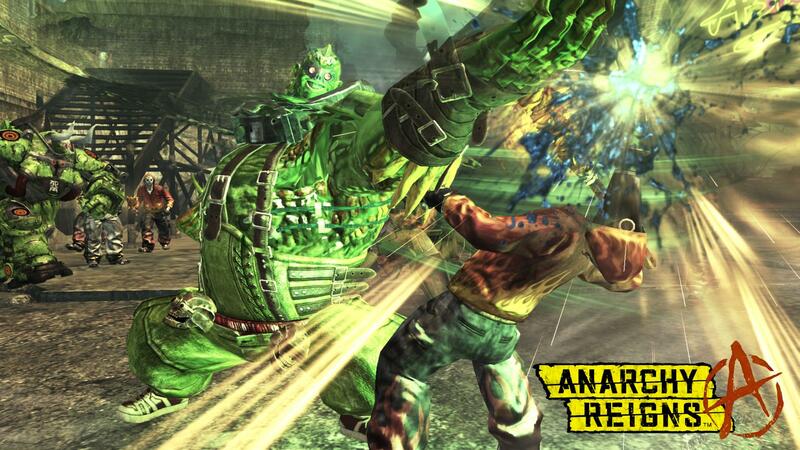 Anarchy Reigns, at a hideously low retail price of around £20, is simply a must-play. Unfortunately, I don’t have the means to capture gameplay footage from my PS3. Promo screenshots will have to do.